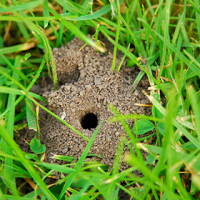 We as lawn experts are constantly battling moss and thatch problems in our customers lawns, and given that we are now around the corner from Spring, we thought it would be a good time to take a look at what they are, how they’re caused and how they can be managed. What is Moss and Thatch? Mosses are small flowerless plants that typically grow in dense green clumps or mats, often in damp or shady locations. There are several types of moss that grow on lawns. These are usually coarse, loose, green or yellow-ish green tufts between the grass, but can form densely matted tufts or, in the case of Polytrichum, appear like small forests of miniature Christmas trees. Moss gives the turf an uneven colour and surface. Loose mosses make the lawn feel spongy to walk on. Thatch is a loose, intermingled organic layer of dead shoots, stems, and roots that develops between the zone of green vegetation and the soil surface. Thatch build up begins when turf produces organic debris faster than it can be broken down. Poor drainage – Here in the UK we have no shortage of rain, and it’s a sad fact that lawn grass does not tend to thrive in wet soil. When that soil becomes too waterlogged, the conditions favour moss over grass, and this can quickly become a problem. Shady areas – The lack of sunlight will mean that soil stays damper for longer and the grass does not receive as much light as it needs. The damp soil, combined with poor drainage can lead to conditions that allow moss to excel. Shallow soil – Turf grass typically needs soil deeper than 4-5 inches. Without this, the grass will struggle to gain the nutrients it requires, making it weaker. The weaker the grass is, the harder it will be to stop moss establishing. Mowing the lawn too short – This is an all too common mistake, because whilst in the short term it makes your lawn look great, in the long term you are actually weakening the grass, which will allow moss to take over. Acidic Soil – Turf grass generally does not fare so well in acidic soil, whereas moss will often establish easier when the soil is acidic. 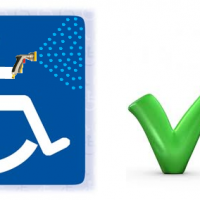 Other potential causes include diseased, weak or sparse turf, low fertility, spongy swards and compaction. We analyse these factors in your lawn and can very quickly determine which of these may be causing the moss; this will then help us to give our recommendation for the best method of treatment. Moss spreads by releasing spores into the air. It does not have roots, but it instead simply spreads across a damp soil surface. This happens at two points in the year, early spring (around April) and again in early autumn (around September). This is important to remember as it is best to act before spores are released when trying to treat it. Dead moss can be as harmful to your lawn as when it is alive. Dead moss turns to thatch, and thatch acts as a sponge and barrier to your lawn, absorbing moisture that lands on the surface, meaning the grass roots cannot reach it. All this extra moisture above the soil is then the perfect habitat for……you guessed it – moss! How should moss be treated, removed and prevented? Once we have identified the causes of the moss in your lawn, it’s important that it is treated at the correct time, and in the right way. 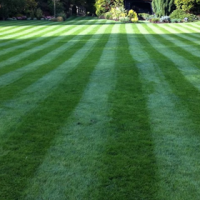 Our winter lawn treatments; in particular focus on controlling the moss in your lawn. 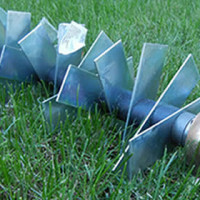 Improving drainage by aerating is also an important procedure that we complete as this will help prevent moss growing, as it cannot establish as easily on a dry lawn surface. When it comes to removing moss from your lawn, scarification is the best method of removing a large percentage of the moss build-up. 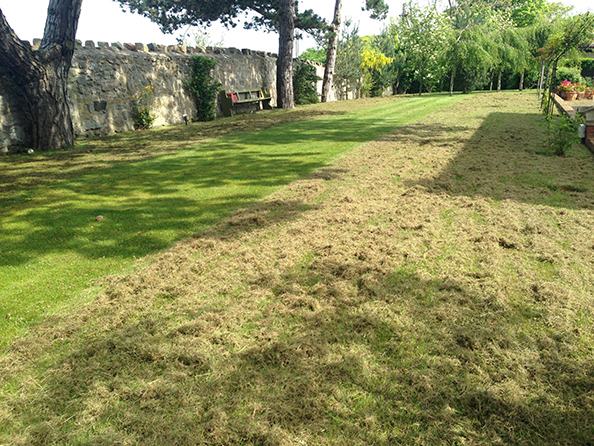 Although lawn scarification is primarily intended for removing thatch, scarifiers are effective at removing moss as well. 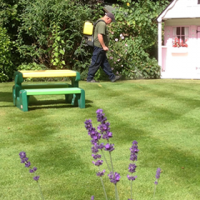 Tim and his team provide expertise and professional lawn treatments to homeowners in West Sussex and South Surrey who want a beautiful lawn that they can be proud of.